If you do, come along and join us at the Plymouth Barbican Pirate Weekend on Saturday 11 May. Full details and our timetable here. 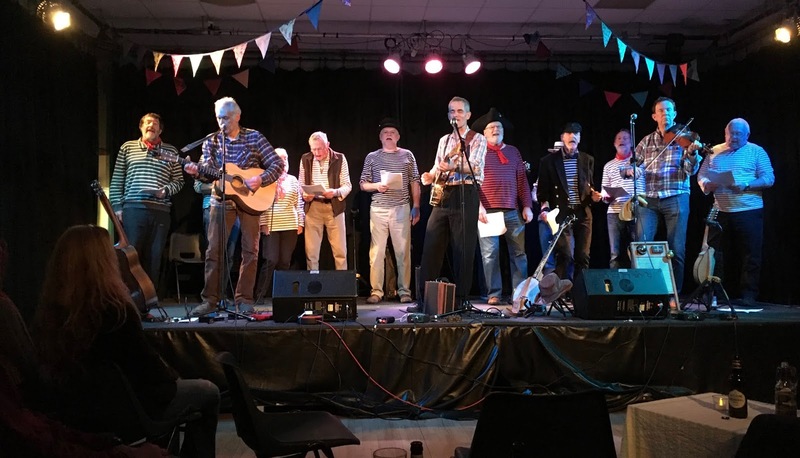 A great night was had by all at Calstock Hall on Friday evening when the Kit Hillbillies and Tavy Tars got together for a 'Songs of Mayhem' concert. 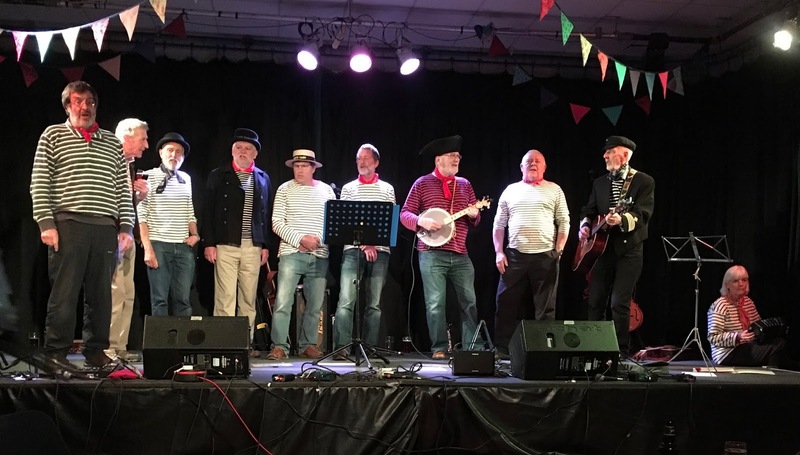 This was a fundraiser for Calstock Village Hall and was well attended. The Tars sounded off with a shanties and songs of the sea set, followed by the KHB with an old timey, bluegrassy set. The two groups teamed up for a great finale of KHB songs. The stage seemed to flex a bit, but stood up to the onslaught! It all finished in time for those who had travelled by train to catch the last train down the valley too..
Cadets from Weir Quay Sailing Club are holding a number of fund raising events to pay for a 5 day sailing trip on the sail training vessel 'Leader' arranged by Weir Quay Sailing Club. 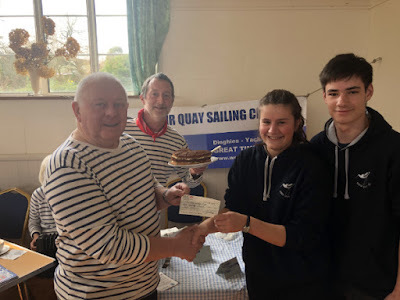 On Saturday the Cadets were selling cakes at The Bere Ferrers Community shop and the Tavy Tars dropped by to sing a song and present a cheque. The picture shows treasurer Ian presenting the £300 cheque to the cadets. 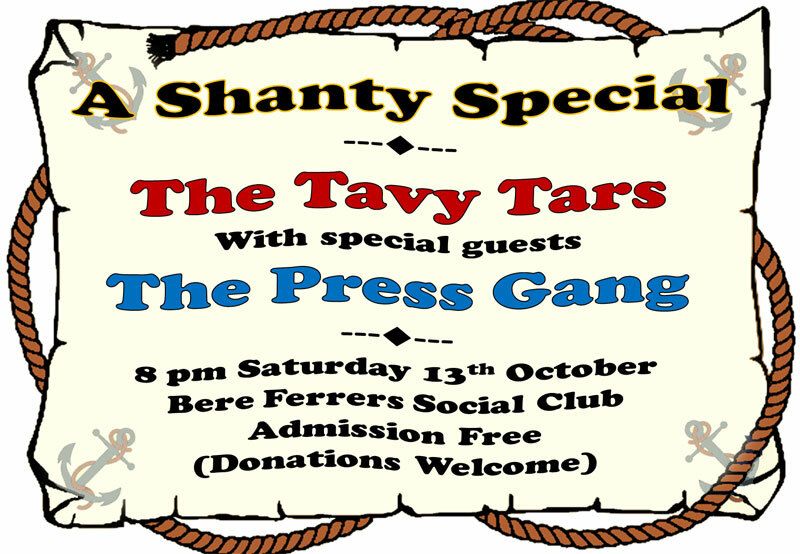 A last minute cancellation on 13th October by the visiting Shanty Crew, Press Gang, from Mevagissey could have meant disaster but for the timely intervention by local Bere Ferrers musicians. 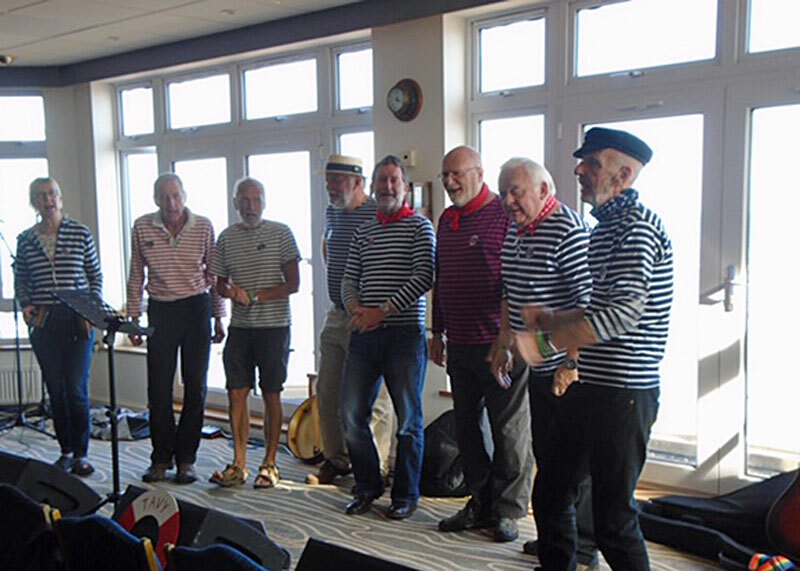 The Tavy Tars kicked the evening off with their usual rollicking sea shanties combined with contrasting lyrical songs from the sea. 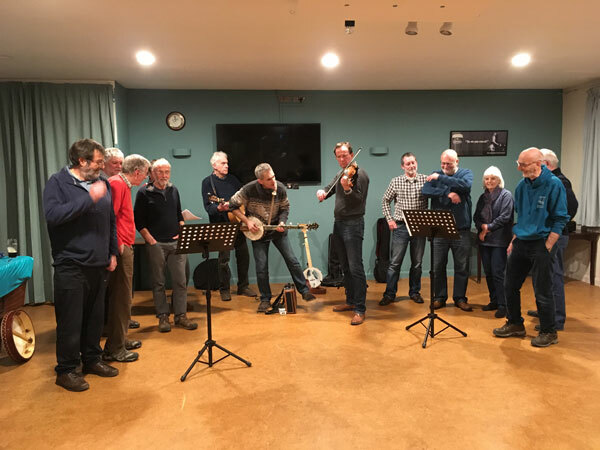 They were followed by local harp builder Tim Hamson who gave a wonderful performance of early Vivaldi music written for the mandolin. He was playing a replica he had built of an 18th century Welsh triple harp. Later in the evening, Ferrers Reel gave us a lively delivery of various jigs and reels. 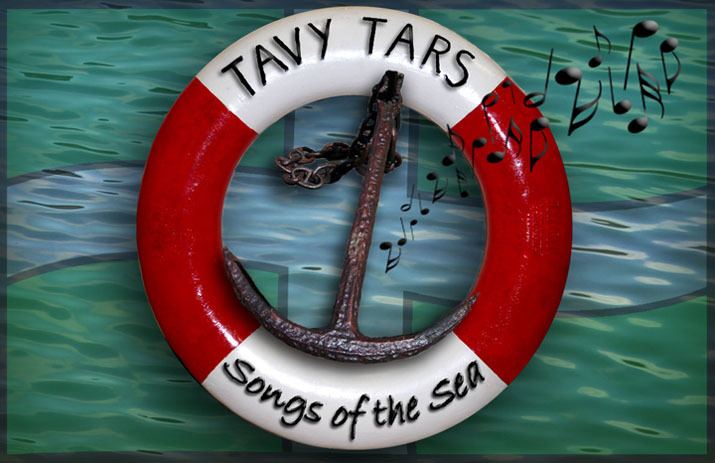 The evening closed with the Tavy Tars leading a vigorous singalong, the audience raising their voices with gusto. A purpose of the event was for the Tavy Tars to present money they had raised over the past two years to their chosen charities. This included over £1500 being shared between the RNLI, TASS, St Luke’s Hospice and Help For Heroes. 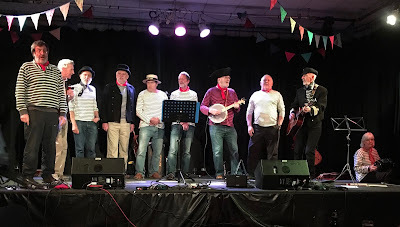 29th September saw us at the first Teignmouth Shanty Festival. We did a couple of venues, one at the Teignmouth Corinthian YC and another over the water in Shaldon at the London Inn. 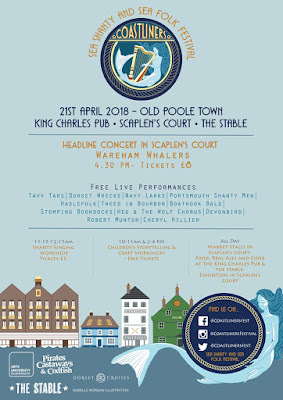 This festival was very well organised and the hospitality was excellent. Thank you to all concerned. 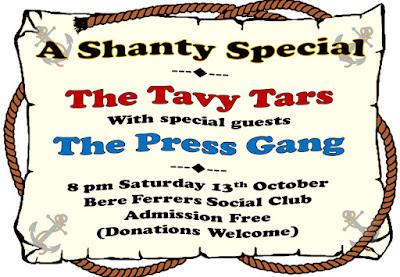 Tavy Tars plan to be here!